Walking through the Lincoln Memorial Reflecting Pool with the Washington Monument in the distance, Hades marvels at humanity's ongoing efforts to achieve godhood. Faust tells him that humans continue to be legion, at which Hades says that's why he brought a legion of his own: the dead of Arlington National Cemetery suddenly become undead. Meanwhile, Lois, her father and Steve Trevor, all together in a Humvee, discover that telecommunications are not functioning just as they smash into the first of the zombies. Lois whispers to Clark for a sign that he can hear her, which is promptly delivered in the form of a hovering Superman's "Arctic breath" stopping the zombie horde in its tracks. A military chopper descends on Hades, raining bullets, and Faust transforms nearby military personnel into harpies, which then take down the chopper. 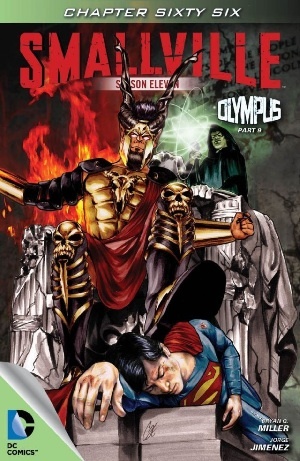 Superman appears, unfamiliar to Hades, who raises a cyclone, alarming Clark. Next thing everybody thinks they know, the cyclone has turned into a gigantic, zombified arm. Back at DEO headquarters, Hippolyta has tired of her post-escape medical attendees and tries to convince Diana that they should both return home, that the affairs of this land are not their concern. But Diana knows that Hades will eventually take his war to Themyscira and tells her mother, whose armor she has now donned, that she will do as her mother once did: fight. Story - 3: Zombies, huh? Great. Must be Halloween soon. At least they're about as effective as they should be against Superman, which is to say not at all. But what would a tale featuring magic and ancient gods of death be without a little grave walking? This story continues to bore me. Lois continues not to have a role. I continue to think of Steve Trevor as Oliver, and, I swear, even started to write "Oliver" up in the synopsis when initially describing the scene Steve is in. See, there's nothing about him that has needed for him to be "Steve Trevor" for anything related to him to happen. Nothing. He's just another blonde dude on Smallville with a different name because Wonder Woman is in this story. In fact, the same is true of Lois in this arc, and that, of course is much, much worse since Lois has had, and should continue to have, a truly pivotal role in the overall story that is Smallville. Her function in "Olympus," however, is to be a vehicle exposition. What a bummer. Here's a question, though: did that cyclone of Hades' turn into the big arm or are they somehow separate phenomena? It even sort of looks like Hades turned the Washington Monument into the arm, but I just can't be sure. What did y'all think? Fanboys and girls more fanatic than me, meanwhile, will have cheered Diana's costume change, and that's just as well. It doesn't matter to me (I like the white outfit she was wearing at the start: it fit the Smallville aesthetic), but that scene at the end of this chapter does do a good job of wordlessly conveying the upping of the stakes for the coming final act. I still say the capture and rescue of Hippolyta held little tension, mostly because we know nothing about Hippolyta and almost nothing about Themyscira and why Hippolyta left. We have no reason to care about her plight, in other words, except that she's Diana's mother. And maybe that should be enough, but we hardly know Diana in these pages, either. This strikes me as the classic Smallville tactic of depending for sympathy on what the audience already knows about these characters, which I always found peculiar not simply because it tended to be an easy way to excuse plot holes but also because, as a strategy, it risks undercutting the value of whatever changes are made to those characters for the purposes of aligning them with Smallville. I will never get over Mikhail Mxyzptlk, but other than that my problems with the television show have almost nothing to do with deviations from the mythos. Anyway, that's all I've got this week. Until next week, then, when we can talk about the inevitable FIGHT™! Art - 5: Surprisingly, Superman looks different again in this issue, more like Bruce Campbell than Tom Welling, at least in that one panel with the alarmed facial expression as Faust unleashes that cyclone. But whatever, the style is intoxicating and I hope Jimenez stays on this title for a good long while.